We've started mapping and stopped a couple of times to make further adjustments to the aerials, so not much more has been achieved, but it is just starting to happen now. This is because of the amount of tweaking that can still be done to try to get the images to line up better, and more masking needed as a result of, for example, discovering the siding across Cumberland St into what is these days Spotlight (without a siding) that can be seen lower left. 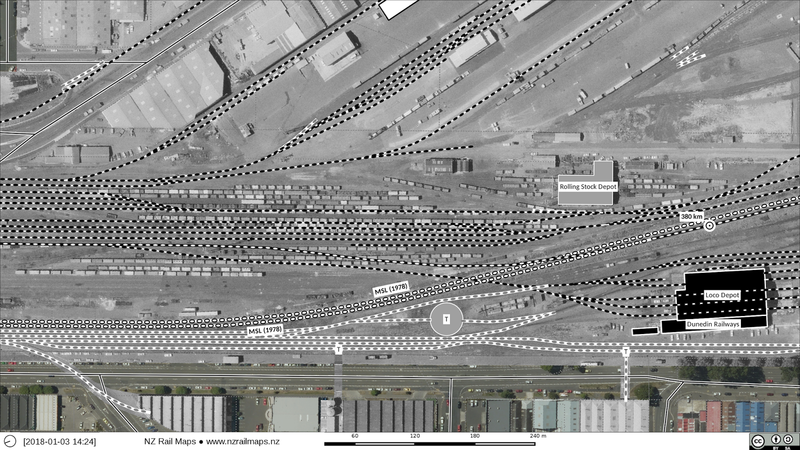 Some of the other detail in this photo includes the Dunedin loco depot, the old rolling stock depot known as "The Gully" that was later taken over by OETT, the old turntable, the former positions of the double track mains (realigned as a single track into the middle of the old yard) and a couple of wagon turntables connecting right angle sidings across Cumberland St as well. When it came to alignment I exploited the use of the three separate images to get the best possible alignment of the two bridges at either edge (the Water of Leith bridge at the north end and the Andersons Bay Road bridge at the south end) and the station in the middle, whilst also aligning the tracks as much as possible at the joins. This entailed in particular some extra rotation of the north most image. The biggest problem is putting dates on everything, for now there is just going to be one composite image with everything mixed in together because in reality I need a lot more different dates of imagery to be able to show reasonably well when things appeared and disappeared. And with the size of this yard, at this time I repeat there are no plans to have multiple generations like I have done with some other stations. But I am waiting for the older stuff going back to the 1940s to come online, as we know Otago is an area that is currently being added and new pictures are coming online every day. I expect it will be possible to find some stuff later than 1978 just for looking at to see what has been happening. The earlier stuff is going to give me a lot more detail like, for example, additional sidings and the old loco depot, of which in the 1978 photos you can just see the foundations, as it was replaced in the early 1970s.